It may feel like the kids have only just gone back to school but in a couple of weeks’ time it will be half term! If you’re planning to escape the onset of winter with a sunshine break, we have some great sun protection deals up for grabs, including free gifts and money-off on selected lines. 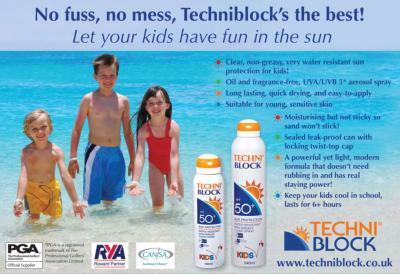 We are now back in stock of our large, 340ml cans of Techniblock SPF 50+ KIDS sunscreen. Techniblock offers fragrance-free, non-greasy, quick and easy to apply protection that lasts for several hours. With Techniblock, you won’t have to pin your young ones down and rub in thick, gooey creams that constantly need re-applying, Our KIDS sunscreen is very long lasting and extremely water resistant, so you can be assured that it will keep little ones protected even whilst they are in the pool. And because it’s not sticky, sand won’t stick to it! If you buy two large cans of KIDS sunscreen, you’ll receive a 10-pack of Mossi-bands worth £10 absolutely free. Colourful and waterproof, these bands are infused with natural oils such as Citronella, Lemongrass and Geranoil to keep the bugs away. Just slip one over a wrist or ankle for protection against bites. Going on safari or a hiking holiday and in need of sunscreen with repellent? We now offer a sunscreen with Citronella for the daytime. Techniblock SPF 40 Citronella comes in a handy, pocket size spray which is ideal to protect arms and legs. And come evening, our South African manufactured insect repellent Peaceful Sleep will protect against midges, mosquitoes and flies from dusk until dawn. Just £10 a tin or save up to £6 when you buy more than one can. If you want a lower SPF, we are pleased to introduce a new brand to the Techniblock website. Coppertone is an American sunscreen that is hugely popular in the States because, just like Techniblock, it provides light, non-greasy but very long lasting protection in an SPF 15. Coppertone Sport SPF 15 is breathable on the skin so it won’t clog pores, which can lead to breakouts and prickly heat. Water resistant up to 80 minutes, it offers protection for up to 3 hours depending on skin type and is the perfect alternative, following the discontinuation of Techniblock SPF 15, for those who want a lower SPF. Shop now for fast delivery, secure payment and great customer service!